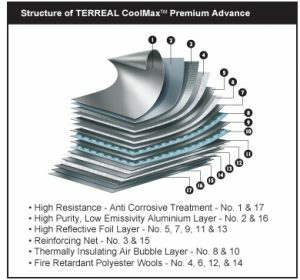 Terreal CooLMax™ Premium Thermal And Acoustic Insulation System. GreenStar Eco-thinking From Terreal. The sun heats the roof and, through it, the attic and ceiling, causing temperatures to rise inside your house. 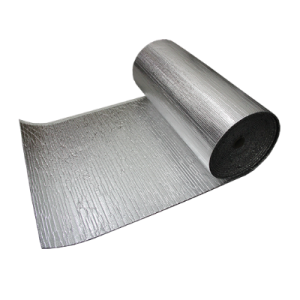 While clay roof tiles and insulation help reduce such heat gain, no insulation material works as well as CooLMax™ Thermal Reflective Insulation. 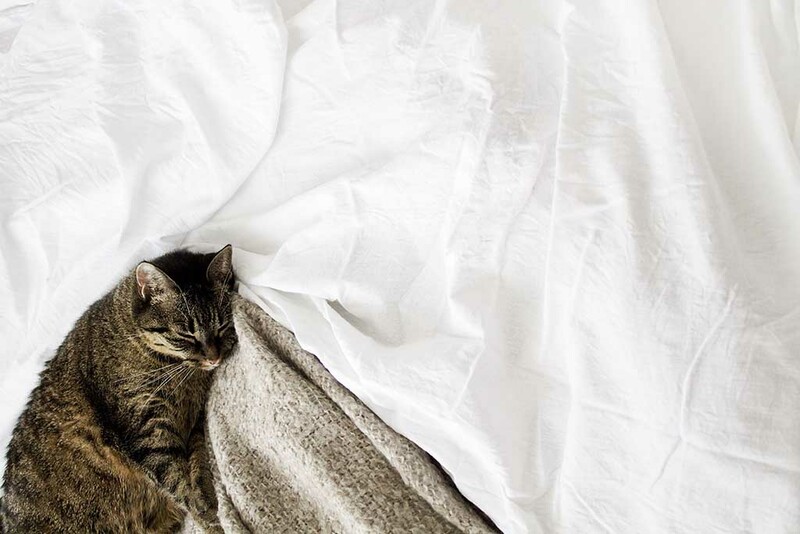 And this is because it not only reduces heat gain during the day but – unlike mineral or glass wool, also permits heat dissipation during the night. 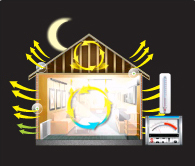 Which makes air-conditioning much more energy-efficient and the inside environment much more livable. CoolMax™ Premium outgreens all others – no other equivalent insulation solution achieves the * 13 GBI Green Points that it can. Six different CoolMax™ Premium insulation solutions with increasing Energy Efficiency performance and GBI Green Points achievement ratings are available to suit different needs. The Green Building Index (GBI) is the industry-recognised Green Rating Tool developed by PAM, the Malaysia architect association. It is specifically designed for our tropical climate and evaluates sustainable aspects of buildings where 100 is the maximum achievable GBI Grren Points with a minimum of 50 points required for GBI certification. The flow of heat energy between two surfaces with no physical contact (IR Radiation). Resistance to radiation is measured by Emissivity (E). 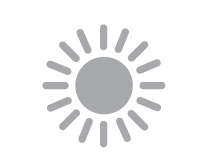 The direct flow of heat through a material, resulting from direct physical contact. Heat transferred through conduction is measured by Conductivity (K). 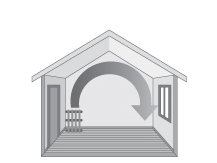 Heat transfer by movement of air where cool air is forced down and warmed by the heat source in a continuous cycle. 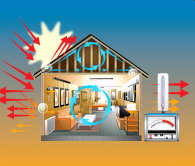 By reducing heat gain, less energy will be required to make room temperatures cool and comfortable. 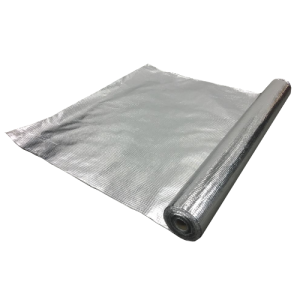 During the day, it is heat from radiation which has to be reduced to ensure cooler temperatures and greater comfort. 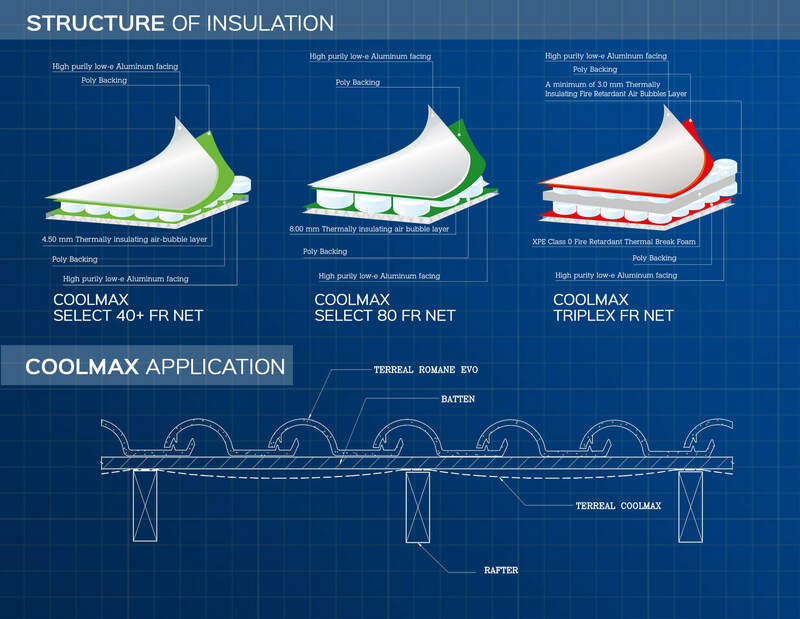 CoolMax™ products are designed to block 97% of incoming radiation heat. This should therefore be the first priority for reducing the need for air-conditioning or for making it work more efficiently. After sunset, radiation ceases to be an issue and convection currents are now needed to more efficiently dissipate heat to the outside. 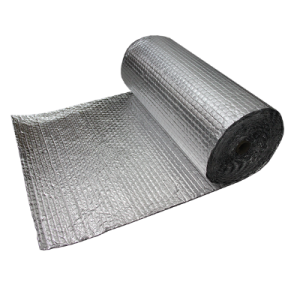 Mineral rock wool or glass wool store heat and create heatlags. For low-rise residential buildings, the roof is more than half the solution. 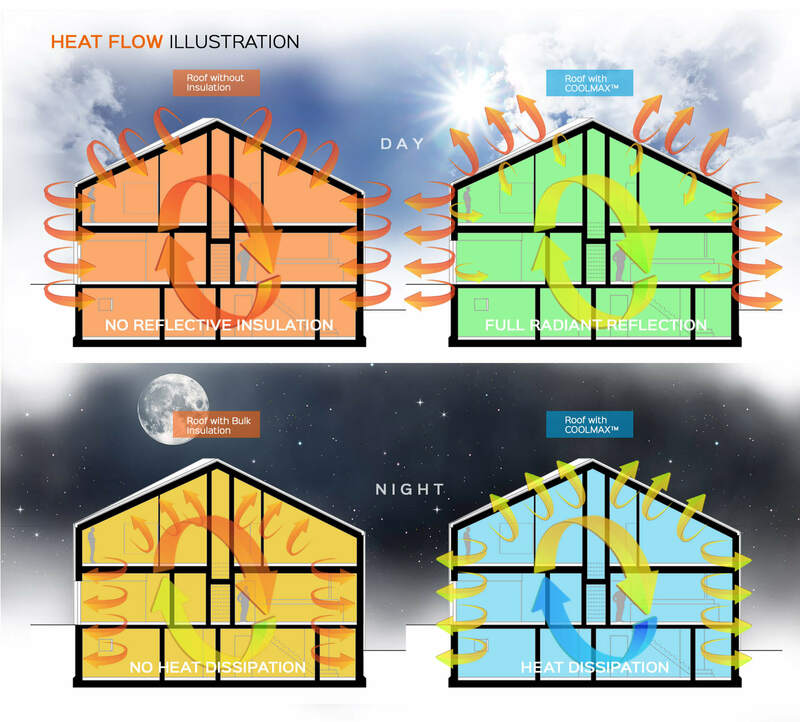 The sun heats up the roof structure through radiation, most of which penetrates the roof space due to high emissivity. 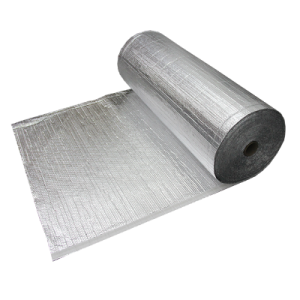 This affects attic temperature which affects ceiling temperature, which in tum directly increases cooling load. This is called heat gain. In tropical countries like Malaysia, up to 75% of heat gain is through the roof – and as much as 93% of the heat transmission is through radiation. An energy efficient ‘Green” roof is therefore critical to the overall green effort. Roof design and ventilation as well as choice of material and insulation determine the overall energy efficiency of the roof. 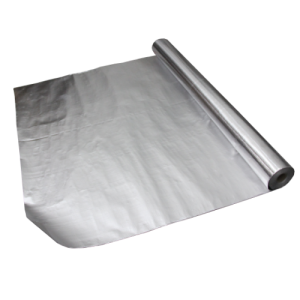 Other than gold, only pure Aluminium is able to block radiation heat. 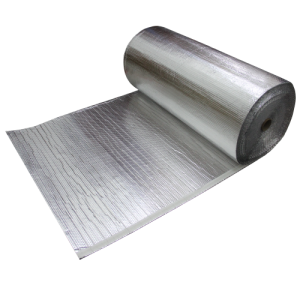 It has 5% Emissivity, meaning that each layer of aluminium will block and reflect 95% of incoming radiation heat. 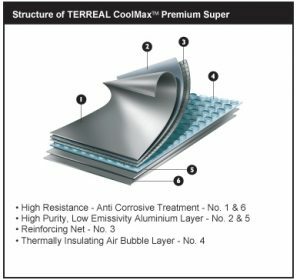 CoolMax™ products use several layers of aluminium: 2 for CoolMax™ Premium, CoolMax™ Premium Super, CoolMax™ Premium Multi and 7 layers for CoolMax™ Premium Advance. Each layer will block and reflect 95% of incoming heat. 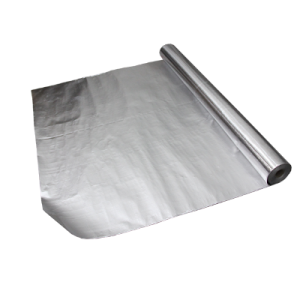 Low K conductivity air bubble cavities block heat gain by conduction during the day but do not block natural convection during the night. 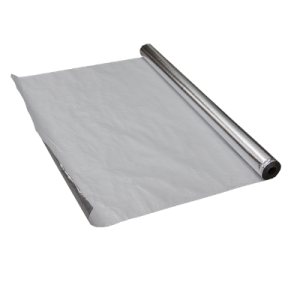 Layers of XPE fire retardant foam / Polyster wools are used in CoolMax™ Premium Multi and CoolMax™ Premium Advance to provide a Noise Reduction Coefficient up to 85% for additional accoustic insulation properties. 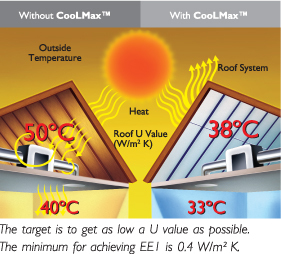 Roof U Value, according to Code of Practice MS 1525:2007, is a concept used to rate Energy Efficiency (EE) performance. 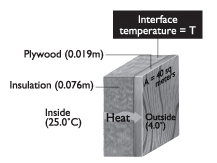 Roof U Value indicates thermal transmittance (the roof’s ability to transmit heat) and is expressed in W/m2K, where the lower the U value, the better the roof in resisting heat transfer. No equivalent system achieves as much as 13 GBI Points *. Ours is a tropical country where thunderstorms are at times a daily occurrence. With high-definition television set and home entertainment systems now a common feature in most upscale residences, it is important that home theater rooms facilitate the best experience. Fire retardant foam in CooLMax™ Premium Multi and CooLMax™ Premium Advance help provide the necessary acoustic insulation.